Six Flags Entertainment (NYSE: SIX) reported record results for 2016, beating analyst estimates for top-line revenue growth but fell a penny short of estimated EPS. Revenue was up almost $22 million for Q4. The successful close to 2016 was driven by increased attendance across its portfolio of parks during its two main events, Fright Fest and Holiday-in-the-Park. 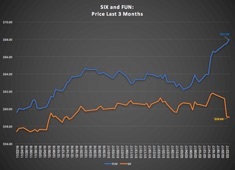 On the full year, SIX was up $55.5 million dollars or 4.4% over 2015. Adjusted EBITDA was also up 5.2% over full year 2015 at $506.6 million. SIX’s CFO, Marshall Barber, mentioned on the earnings call that deferred revenue was up 27%, sitting at $124 million dollars. Deferred revenue is, as stated in an earlier note, a proxy for season pass and membership sales. It is a good barometer of how the new season is shaping up for Six Flags. SIX’s leadership also explained how they have had sustained success over the last seven years. Top-line revenue and attendance growth has been fueled by (1) increases in season pass and membership sales, (2) strategic increases in one-day ticket prices and pairing back discounts, (3) new in-park services programs, e.g., the all-season-dining-pass, designed to capture incremental discretionary spending from park visitors, and (4) growth in international licensing opportunities. The growth in season pass sales was assisted by the roll-out of Holiday-in-the-Park to additional parks and continued investment in Fright Fest. SIX is also rolling out a Mardi Gras event in two of its parks, Six Flags Mexico and Six Flags San Antonio. John Duffey, CEO of Six Flags, made reference to SIX’s 4th of July event as well. SIX now delivers four seasons of thrills and fun, which certainly makes its membership and dining programs more attractive. The foregoing summary of SIX’s strategy helps explain a point made earlier about FUN. There are a lot similarities in the current strategies of the two regional theme park operators. But SIX’s strategy includes an international component, while FUN is focused on the development of its resort business. By resort business, I mean accommodations and complimentary business lines like the sport tournament complexes. Both strategies, international and domestic resort, seem reasonable. It remains to be seen which path is the most lucrative. I would be remiss not mention that SIX’s stock did not perform well after its earning announcement. It fell over $2 on the day. The chart below shows its performance over the last three months. Although it is not always easy to interpret the street’s reaction to a company’s earnings release, it was a curious reaction to an EPS miss of just $0.01. Perhaps it was that SIX’s leadership mentioned it could now pursue the option of converting itself into a REIT (i.e., a Real Estate Investment Trust). The need for the move might have caused some confusion. It seemed clear to me at least that SIX had not made any decision yet. It will explore the REIT option as the NOLs (i.e., net operating losses which are used as a way of reducing future taxes) were exhausted. It may also be that SIX needs $55 million to hit its Project 600 target, which is based on modified not adjusted EBITDA. Modified EBITDA sits at $545 million at the end of 2016. The street may view $55 million a stretch after a year with “only” $25 million in EBITDA growth (both modified and adjusted EBITDA grew at the same pace). Given what SIX’s leadership said about its international growth opportunities and its deferred revenue growth, as well as its seven years of success, it might prove unwise to bet against SIX eventually getting there. Again, in the interest of full disclosure, the author is long in both FUN and SIX.